What is the Black Church’s Role in Advancing African American Wealth? 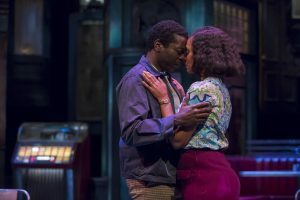 [Milwaukee] – Milwaukee Repertory Theater’s 65th Anniversary Season concludes in the Quadracci Powerhouse with Two Trains Running, part of Pulitzer Prize-winning playwright August Wilson’strailblazing American Century Cycle, April 16 – May 12, 2019. The Two Trains Running cast features local husband and wife duo Chiké Johnson (Our Town, Milwaukee Rep) as Sterling and Malkia Stampley (Dreamgirls, Milwaukee Rep) as Risa along with Frank Britton (Shape, La MaMa) as Hambone, Doug Brown (Jitney, Cincinnati Playhouse in the Park) as West, Jefferson A. Russell (Our Country’s Good, APT) as Wolf, Raymond Anthony Thomas (Jitney, Broadway) as Memphis, and Michael Anthony Williams (Persephone, BAM) as Holloway. Two Trains Running is directed by Timothy Douglas (Gem of the Ocean, Milwaukee Rep) with set design byTony Cisek (The Night is a Child, Milwaukee Rep), costume design by Kara Harmon (The Niceties, MTC), lighting design by Michael Gilliam (Bonnie and Clyde, Broadway), compositions and sound design by Matthew M.
Hospice Savannah Art Auction Celebrates 40 Years of the Art of Living!